The optomap ultra-wide digital retinal imaging system helps you and your eye doctor make informed decisions about your eye health and overall well-being. Combining your eye doctor’s expertise with optomap technology brings your eye exam to life. 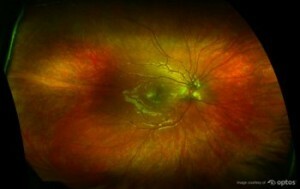 How is the retina typically examined? Examining the retina is challenging. An eye doctor looks through your pupil to examine a layer of tissue that covers the back and inside walls of your eye. Traditional viewing methods can be effective, but difficult to perform. They are also carried out manually without any digital record. The optomap ultra-wide digital retinal imaging system captures more than 80% of your retina in one panoramic image. Traditional methods typically reveal only 10-12% of your retina at one time. The unique ultra-wide view enhances your eye doctor’s ability to detect even the earliest sign of disease that presents on your retina. Seeing most of the retina at once allows your eye doctor more time to review your images and educate you about your eye health. Not yet, but it is an emerging standard for eye health and millions of people worldwide have benefited from this kind of imaging. Lakeshore Eyecare Center is proud to offer this breakthrough technology to our patients. At Lakeshore Eyecare Center we use the Optos optomap system as part of our comprehensive examination process and our dedication to providing patients the best available eye health care.